Want to know how New York will get to that pretty impressive place in the clean-energy firmament? Here's an explanation, some important context, and three key takeaways. 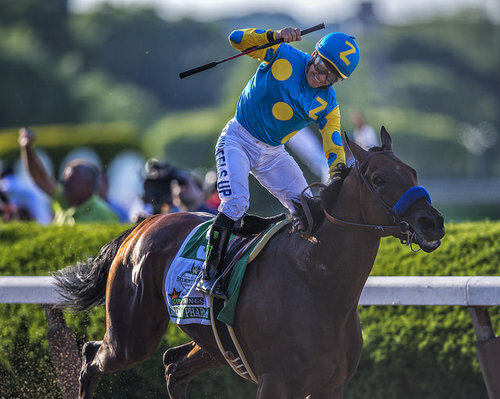 (And since, right here in New York, a few weeks back, we just saw a very special horse by the name of American Pharoah complete the first sweep of the Triple Crown in 37 years, I've thrown in some horse racing metaphors for good measure). As mentioned above, tackling climate change and transitioning to a clean energy economy has long been an area in which some key states, New York included, have served as trailblazers. (For other examples of serious, state-level leadership, check out recent initiatives announced in California, Hawaii, and Vermont.) Today's 2015 NYS Energy Plan builds on the Empire State's legacy, outlining a bold platform that--if executed effectively--would cement the state's leadership position. For some time now, the science has made clear that we need to slash greenhouse gas emissions by at least 80 percent by 2050 in order to avoid the worst impacts of climate change. Accordingly, several nations and U.S. states and have adopted that goal, New York among them. In 2009, then-Governor David Paterson issued New York's Executive Order 24, establishing this target for New York, and upon taking office for his first term in 2011 Governor Cuomo wisely renewed it. This long-term, science-based target is important. But implementation requires details. How do we get there? What policies will deliver those reductions? The plan released today provides that roadmap. For readers interested in the plan's structure and layout, it is broken down into seven categories: 1) renewable energy; 2) buildings and energy-efficiency; 3) clean energy financing; 4) sustainable & resilient communities; 5) energy infrastructure modernization; 6) innovation and research & development; and 7) transportation (with a strong focus on scaling up electric vehicles). How do you get across the finish line? The three jewels of the crown. 1) Energy Efficiency: reduce energy consumption in buildings 23 percent by 2030--Cut the fat: Use energy more efficiently; reduce demand. A great racehorse wastes no energy and instead glides across the ground effortlessly. New York's energy system can mirror that image if it executes and implements these energy efficiency commitments. The Public Service Commission (PSC), which regulates the state's investor-owned utilities and clean energy programs, can ensure we capture all cost-effective energy efficiency--and, there's a lot out there--by adopting and implementing policies that will achieve these targets and ensure that utilities, agencies, and all New Yorkers get us over the finish line. 2) Renewable Energy: 50 percent renewable electricity by 2030--Clean it up: get more of the supply from clean resources, less from fossil fuels. Great racehorses are powered by expertly designed regimens. New York should be, too. Even as we reduce the amount of energy demand by ramping up energy efficiency, according to the new plan, New York will clean up its energy supply by getting more electricity from renewable resources, such as large and small solar projects, as well from wind power projects--both onshore and off. 3) Tackle Climate Change: Cut Greenhouse Gases 40 percent by 2030 from 1990 levels--Decarbonize the NY Energy System. Stick to the training regimen, stay the course. The challenge presented by climate change will not be solved overnight. But through the implementation of policies that will cut greenhouse gas emissions statewide by 40 percent over the next 15 years, in the fields of power generation, industry, buildings and transportation, New York can ensure we get where we need to go, and show the rest of the country how to do it, all while growing our economy and creating clean energy jobs. Sometimes the best-laid plans never come to fruition. However, in the case of this plan, New York is already on track. Also being released today in concert with the plan's release is NYSERDA's updated 10-year, $5-billion Clean Energy Fund proposal. This portfolio will support clean energy programs like Governor Cuomo's NY-Sun Initiative, energy efficiency programs targeted to low-income customers and multifamily housing, and the New York Green Bank. The state also recently proposed $1.5 billion over the same 10-year period to promote large-scale renewable electricity projects, like wind farms and large solar arrays. These bold policies are being rolled out as part of the state's overarching Reforming the Energy Vision effort, which seeks to transform the state's electric system, along with its utility business model, to accelerate the deployment of clean, distributed energy resources and empower consumers to better control their energy use. This is great for the climate, no doubt about it. But it's also what New York needs to further build its economy. Plans like these, when designed well and thoughtfully implemented, create jobs and save consumers serious money on energy. New York's experience in the Regional Greenhouse Gas Initiative is a case in point. The program, which includes nine Northeast and Mid-Atlantic states, has helped cut greenhouse gas pollution from power plants by more than 40 percent since it was first implemented in 2005. At the same time, the region's economy has grown faster than the rest of the country's, adding thousands of new jobs in fields like energy efficiency and renewable energy, and saving customers hundreds of millions on their energy bills already, with billions more to come. New York's clean energy goals, and RGGI's, are just the kinds states and regions should adopt if they're looking to create new jobs and save residents big money on energy, all while significantly cutting carbon pollution. All in all, there's a lot to like in New York's nation-leading State Energy Plan. We look forward to working with the state to make these plans a reality, one that benefits all New Yorkers, and one that other states will want to follow. After all, like American Pharoah showed us on that recent sunny Saturday afternoon at Belmont, this horse can go the distance. You can bet on that.